"After her flight from Lochleven to Carlisle, Mary [Stuart of Scotland] was in dire need of clothes and asked [Queen] Elizabeth to send her some dresses. Elizabeth harshly denied her request, because Mary had not asked Elizabeth for just any kind of clothes, but for used dresses from Elizabeth's own wardrobe. As a reply, Elizabeth sent some lengths of black velvet, black satin and black taffeta. With this gift Elizabeth not only denied Mary royal dignity but also sent a sharp reprimand for Mary's personal behavior. " "The dress consisted of a tightly fitted short doublet with a collar and cuffed sleeves as well as breeches and a circular wide cloak or cape [Spanish cappa] reaching to the knees and displaying a flat collar. A rich lace collar or a falling band of lace or fine linen, called a rabat, and a large hat decorated with ostrich plumes, completed the ceremonial male dress. " Comparing the state portraits of the emperors Leopold I, Joseph I, Charles VI, and Joseph II, one finds that the main features remained unchanged throughout their reigns, but certain details were altered to conform to changing fashions. For special occasions the clothes were made of silk fabrics richly woven with gold threads (drap d'or), lined with silver fabric (drap d'argent), and abundantly trimmed with gold lace. Lady Mary Wortley Montagu notes that in Vienna in 1716 "I saw t'other day the gala for Count Altheim, the emperor's favourite, and never in my life saw so many fine clothes illfancied. They embroider the richest gold stuffs; and provided they can make their clothes expensive enough, that is all the taste they shew in them" (Letters of Lady Montagu, vol. 1. p. 249). Austrian books of emblems or impresa from the beginning of the eighteenth century show ladies' Spanish court dresses. The cut of these resembled the pattern of the grand habit or robe manteau, modeled after late seventeenth-century French court dress from Louix XIV's new palace at Versailles. The ensemble consisted of a skirt with a train and a matching stiff bodice that was drawn into a long point toward the waist; it had short sleeves and a very décolleté neckline that displayed the shoulders and bosom. Rows of lace ruffles and engageantes of fine lace decorated the short sleeves. The wide skirt had a long train and it was generally open in the front and turned back to reveal a petticoat. The skirt was supported by stays, and its shape, whether slender, round, or wide, depended on contemporary fashions. False or hanging sleeves were reminiscent to the original Spanish roots of the dress and called "Adlerflügel" (eagle's wings). Lady Wortley Montagu observed of the Viennese court: "Their dress agrees with the French or English in no one article but wearing petticoats, and they have many fashions peculiar to themselves; as that it is indecent for a widow ever to wear green or rose colour, but all the other gayest colours at her own descretion" (Letters of Lady Montagu, 1866, vol. 1, p. 248; fine examples given by Bönsch 1990, 176/14 and 15). A letter from Johanna Theresia, countess of Harrach, to her husband, Ferdinand, on 9 December 1676, illustrates the importance of fashionable dress at court. The countess wrote that she had bought light-colored underwear for herself and their daughter from a merchant, "for when the Empress arrives, one has to have something to wear, for it is impossible to show up wearing nothing" (Bastl 2001, p. 365). The impact of fashionable dress worn in elite circles, and the ability of rulers to make political statements through their dress can be seen in Charles Le Brun's tapestry series called History of the King. The scene illustrating the meeting between Louis XIV and Philip IV of Spain on 7 June 1660 shows that Le Brun gave precedence to the French king by placing him on the more distinguished left side of the tapestry and by making him larger than the Spanish king. The fashionable clothes of Louis draw the attention of the spectator, while Philip's clothing looks modest and old-fashioned. 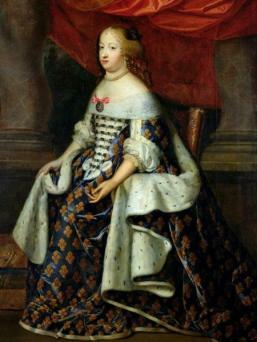 The French court was seen as the new cultural leader of Europe in fashion and court ceremony, and Louis XIV used sartorial rules as a means of exercising power. For example, in 1665 the king awarded to a select group of cavaliers who enjoyed special favors personally granted by the king, the right to wear a blue justaucorps à brevet (warrant coat), lined in red and richly embroidered with gold and silver thread according to a prescribed pattern. (Mikosch 1999, 65/57). Paintings of King Louis XIV and his aristocracy provide vivid visual evidence of the importance of fashion at the royal court. "My wardrobe consisted of five fashionable coats full mounted, two of which were plain, one of cut velvet (velvet having the pile cut so as to form patterns), one trimmed with gold, and another with silver-lace; two frocks, one of white drab (sort of woollen cloth) with large plate buttons, the other of blue, with gold binding; one waistcoat of gold brocade; one of blue satin, embroidered with silver; one of green silk, trimmed with broad figured gold lace; one of black silk, with figures; one of white satin; one of black cloth, and one of scarlet; six pair of cloth breeches; one pair of crimson, and another of black velvet; twelve pair of white silk stockings, as many of black silk, and the same number of fine cotton; one hat, laced with gold point d'Espagne [kind of lace], another with silver-lace scalloped, a third with gold binding, and a fourth plain; three dozen of fine ruffled shirts, as many neckcloths; one dozen of cambrick handkerchiefs, and the like number of silk" (Smollett, p. 256). "I cannot describe to your Lordship how they make fun of me because of my attire; they say it is a shame that I am dressed thus, that my attire ruins a person's looks, and I laugh with them when they criticize my dress, which I would not change for anyone if it were not on your will and order. (Bastl 2001, p. 362) "
Aristocratic country life in premodern Europe was relatively simple, even boring; the pace of life was determined by the seasons and by ordinary everyday events, punctuated by celebrations and festive occasions. Festivals appealed to the eye and used a vocabulary of peculiar attributes that are difficult to decipher nowadays, but that constituted a wordless but well understood language at court in early modern times. There was an inevitable tendency for nonmembers of the elite to engage in what is called "power dressing" in the twenty-first century by appropriating elements of elite dress. One sees in this behavior that dress is both intimate and potent as a means of expressing power; much dressing is power dressing, and power dressing is by its very nature political, in that it is public. "Since you wrote to me that Els [Elizabeth] needed a white beret for her white damask dress, I want to let you know that she is not going to wear a beret but a wreath, which she has to wear at her betrothal. Also, when you said that she is going to need a red beret, I don't think it is necessary because she has a pretty one with a pearl border although it is only black; give it to her, with the jewels on it. But if you want her to have a red one to go with her red velvet jacket, you can get one that has nothing on it so that we can sew the jewels on to it. (Bastl 2001, pp. 363-364) "
This letter is revealing for various reasons: For one, it is an early documentation of a white wedding dress, which was already worn with a wreath at the engagement party, although the "beret" (Bönsch 1990, pp. 174-175) was also considered to be appropriate headwear at a wedding. Secondly, it is clear that the color red for garments also achieved similar, perhaps even greater, popularity with the nobility and was worn in matching shades for the dress and the hat. Apparently velvet was also considered to be a fabric similar in value to damask, since they seem to have been interchangeable for wedding attire. Most generally, it is understood that clothing itself is a matter of intense concern for the family of the bride at an elite wedding. "I am asking you with all my heart to ask our father for a martenskin-I cannot go without one. I have not had one made since I was a child. I have had a coat long enough-all my life-for which one cannot buy a lining at the market. I cannot wait any longer. We have to go to the Reichstag in appropriate dress and other necessary things; but I don't know how to go about it. (Bastl 2001, p. 365) "
The color or rather the non-color, black was associated with the grave impersonality of authority. In Europe, its oldest association is with death, grief, and the fear of death. As the color worn by mourners, its use is very old. It is sometimes suggested that the use of black for mourning was a medieval development: but its use at that time was a revival, not an invention. Roman mourners wore black togas (though the deceased body itself was wrapped in a white toga). And funeral processions in ancient Greece wore black. We are dealing in death with a reversal of the dress code, which converts elegant court attire "a bright red-colored precious dress with trim of silver lace of Spain"-to a funeral dress, or as Anna Maria Countess of Trauttmansdorff writes in her last will of 1704, "the black court gown: the clothing of my corpse in a dark taffeta nightgown." This is an ambivalent procedure in more ways than one: on the one hand, the clothing of the live body in garments that are considered to be beautiful and that maintain or promote status; on the other, the clothing of the dead body with garments that are ugly, and hence diminish or reduce status (Bastl 2001, p. 371). In the above-mentioned letters, Maria Magdalena of Hardegg wrote to her father in September 1616 that her late mother's lambskin has become too small for her and her little sister Sidonia might have her dressing gown, which she was not able to wear anymore. The implication is that were she still able to fit into these clothes she would expect (and be expected) to continue wearing them, rather than replacing them with new clothing. Aristocratic families must have had collections of clothes, for the tailor Hans Janoss found "an old tancolored wool fabric dress, completely redone, sewn with fringes on it" in Regina Sybilla Countess Khevenhüller's trousseau in 1627. The same was true in sixteenth-century England, where Anne Basset had been criticized by Queen Jane Seymour and her ladies for her smocks and sleeves because they were "too coarse" and asked Lady Lisle to send finer material for new ones. Instead, "the Countess of Sussex had decided to have Anne's old gowns made into kirtles (skirts, or skirts and bodices) to save some expense" (Harris 2002, p. 229). The discourse about court culture and aristocratic behavior and clothing in late nineteenth-and early twentieth-century Germany came to a curious conclusion. French civilisation, which implicated the art and artifice of fashion (expressed, for example, in the imperial court of Napoleon III), was dismissed as superficial, opposed philosophically in the emerging ideology of German nationalism by "deep" German Kultur, which was hostile to fashion (Duindam 2003, p. 295). At the same time, fashionable clothing was readily available to a much wider segment of the population than ever before; the court and its clothing no longer held a privileged position as the leader of fashion. By the end of World War I, aristocratic titles survived in some European countries and were abolished in others, but royal and aristocratic dress lost its distinctiveness and exclusivity throughout European society. In the twentieth century, some royals were fashion leaders (Edward, Prince of Wales; Princess Grace of Monaco) and others were models of bourgeois respectability (Queen Beatrix of the Netherlands, Elizabeth II of England), but royals and aristocrats as a group no longer dressed in distinctive and regulated clothing, and were no longer society's principal leaders of fashion. See also Court Dress; Diplomatic Uniforms. Arnold, Janet. English Women's Dresses and Their Construction c. 1660-1860. London: Macmillan, 1964. --. 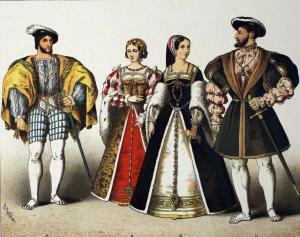 Patterns of Fashion: The Cut and Construction of Clothes for Men and Women c.1560-1620. London: Drama Publishers, 1985. Bastl, Beatrix. "Das Österreichische Frauenzimmer. Zur Rolle der Frau im höfischen Fest-und Hofleben 15.-17. Jahrhundert." In Slavnost ia zábavy na dvorech a v residencních mestech raného novoveku. Edited by Václav Buzek and Pavel Král, 79-105. České Budějovice, Czech Republic: 1996. Gives an overview about expenses for clothes for the lady-in-waiting Anna Josepha von Thürheim 1709-1711. --. Tugend, Liebe, Ehre. Die adelige Frau in der Frühen Neuzeit. Wien, Köln, and Weimar, Germany: Böhlau, 2000. --. "Das Österreichische Frauenzimmer. Zum Beruf der Hofdame in der Frühen Neuzeit." In Residenzenforschung 11: Das Frauenzimmer. Edited by Werner Paravicini, 355-375. Wiesbaden Germany: 2000. Edition of the trousseau for the court of Anna Maria Thurn 1559. --. "Clothing the Living and the Dead: Memory, Social Identity and Aristocratic Habit in the Early Modern Habsburg Empire." Fashion Theory 5, no. 4 (2001): 1-32. Bourdieu, Pierre. Distinction. A Social Critique of the Judgement of Taste. London: Routledge, 1999. Duindam, Jeroen. Vienna and Versailles. The Courts of Europe's Dynastic Rivals, 1550-1780. Cambridge, U.K.: Cambridge University Press, 2003. Elias, Norbert. The Civilizing Process. Oxford and Malden, U.K.: Blackwell, 2000. Harris, Barbara J. English Aristocratic Women 1450-1550: Marriage and Family, Property and Careers. Oxford: Oxford University Press, 2002. Hollander, Anne. Seeing Through Clothes. Berkeley, Los Angeles, and London: University of California Press, 1993. The Letters and Works of Lady Mary Wortley Montagu, edited by her great grandson Lord Wharncliffe in two volumes. London, 1866. 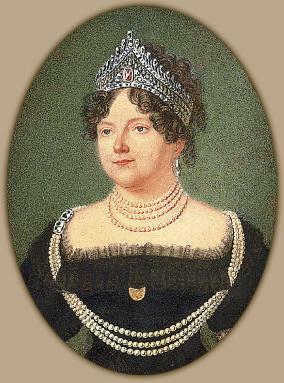 Mikosch, Elisabeth. "Court Dress and Ceremony in the Age of the Baroque. The Royal/Imperial Wedding of 1719 in Dresden: A Case Study." Ph.D. diss., Institute of Fine Arts, New York University, 1999. Pallmert, Sigrid. "Kleider machen Leute-Könige machen Mode. Ein Aspekt des sogenannten Allianzteppichs." Zeitschrift für Schweizer Archäologie und Kunstgeschichte 47 (1990): 49-54. Roche, Daniel. The Culture of Clothing. Dress and Fashion in the Ancient Regime. Cambridge, U.K.: Cambridge University Press, 1994. Smollett, Tobias. The Adventures of Roderick Random. Oxford: Oxford University Press, 1979. Zander-Seidel, Jutta. Textiler Hausrat. Kleidung und Haustextilien in Nürnberg von 1500-1650. München: Deutscher Kunstverlag, 1990.